I really don't have much storage room in my kitchen so I tend to really think about adding a new appliance to the cupboard. 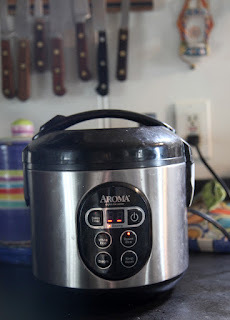 Last spring my friend Kay told me she had purchased this rice cooker (affiliate link). She was in love with it and if Kay is in love with something in her kitchen, I listen. I splurged on one and it is absolutely fantastic. I'm a distracted cook - trying to multi-task too much. To say there has been a few pots of burned rice on the stove is an understatement. I've been thrilled with how this rice cooker slowly cooks my favorite short grain brown rice. Once the rice is done, it keeps it warm for quite a while. It has settings for both white and brown rice. I've been cooking rice in the morning and then storing it in the fridge to eat for lunch or add to veggies for dinner. If you too have been thinking about getting one, I highly suggest it. I have even been throwing cooked brown rice in the freezer - it makes a quick lunch with some steamed veggies cooked in Julia's microwave. 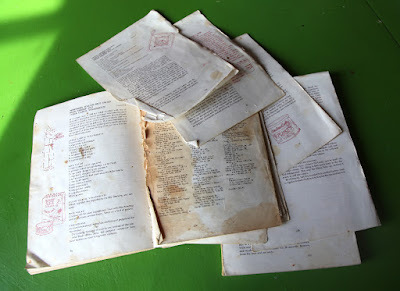 Many years ago, my sister Laurie gifted me a cookbook called The Frog Commissary Cookbook. Published in 1985, it was written by the folks associated with the Frog Restaurant and Frog Commissary in Philadelphia. This book has been one of my favorites for years - so much that it looks like this now. It is held together in my kitchen bookcase with rubber bands. Now that is the sign of a well-loved cookbook. Whenever I am having a party, am going to a potluck or looking for something fun to cook, I turn to this book. It seems like it was way ahead of its time. Orzo and Carrot Salad with Raisins flavored with Sesame Oil anyone? The recipe I have made the very most is a real classic. In the book they call it Northern Italian Rice Salad. The dressing is delicious and is one of those that you might want to double or triple just to have it on hand to whip up a quick weeknight meal - although marinating whatever in it overnight is even tastier. NOTE: This salad keeps in the fridge for days. It also is a perfect recipe for your own interpretation or whatever you have hanging around in your pantry or fridge or coming in from the garden. Over the years I have added raisins, dried apricots, black olives, green olives, celery, chicken, cubed Italian meats, feta cheese..... you get the picture ...... a perfect recipe for winging it and making something out of nothing. 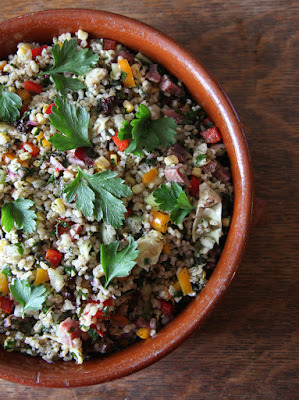 I make this salad for most of my Creative Retreats and all my students love it. Give it a try. Mix all ingredients. I often double the dressing recipe and keep some extra in the fridge to use it as a marinade. NOTE: This recipe is a kicking off point for your own interpretation (or whatever you have in your fridge or pantry. Make sure you add the raisins and capers though because they add a very nice surprise to the palette.) You can swap the rice with couscous, farro, wheat berries, pasta or other absorbent grain. Use whatever color peppers you have but I like to mix up the colors for fun. 1 1/2 cups of some kind of protein chopped into bite size pieces (optional) I have used salami, boneless chicken, shrimp, feta cheese and lots of times no protein at all. Get chopping. This is the most time consuming part of this salad. Mix all ingredients in a large bowl or pan. Pour on the dressing and let it all marinate. Best made the day before. It also keeps nicely in the fridge for a few days. It is a good choice for a potluck. Store and travel with it in a ziplock bag, bring a pretty bowl and pour it in when you arrive at your destination. I also love my rice cooker. I have a different brand though. You might like to know if you haven't figured it out already, you can put your cold rice back in the cooker, push the warm button and it will heat it up perfectly. It takes about 30 minutes for your brown rice. I sprinkle a little bit of water on top of the rice before I turn it on. Enjoy!